Magic Red Casino was launched in 2014 and they have been offering a great online casino product ever since. The brand is powered by the Aspire Global platform which house more than 500 top quality casino games provided by some of the most popular game vendors available. Magic Red Casino is fully supported on all digital devices and operating systems and they are licensed and regulated by the most respected online gambling jurisdictions on the planet. Magic Red Casino is powered by the Aspire Global game platform. The contributing game providers include NetEnt, Play’n GO, Microgaming, NYX Gaming, NextGen Gaming, Aristocrat, Bally Technologies, Pragamatic Play, Rabcat, ELK Studios, Scientific Games and many more. Most of the collection are video slots but there are also other game types available such as card/table games, video poker games, live dealer games and instant win games like scratch cards and bingo/keno games. magic Red Casino’s game lobby is well-structured and easy to manage with several types of options to filter the inventory such as by game type and new games. There’s also a search function available that can be very helpful if you’re searching for a specific game. The customer support at Magic Red Casino is available between 06:00 GMT to 23:00 GMT, seven days a week. The helpdesk can be reached by e-mail or by using the live chat function which is located in the top right corner of the website. The FAQ section is located on the Help page and it’s a great tool to find information relating to bonuses and promotions, payments, technical requirements and general account management. Magic Red Casino is available in English, Finnish, German, Norwegian and Swedish. Magic Red Casino is owned by Exit 42 Limited which is a company registered in Gibraltar and they are operated by Aspire Global International LTD. Magic Red Casino are licensed and regulated by the UK Gambling Commission and the Malta Gaming Authority. Magic Red Casino meets the highest standards of player safety, fairness and responsible gaming policies. Magic Red Casino: Get an EXCLUSIVE First Deposit Bonus of 200% up to €/$500 + 100 Extra Spins! – Offer only applies to new players. – In order to withdraw your winnings, you must wager at least x35 your bonus amount. 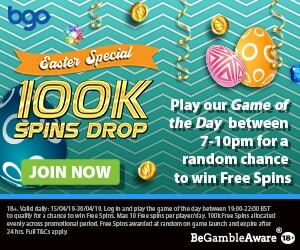 Click here and join Magic Red Casino and get an EXCLUSIVE 200% First Deposit Bonus up to €/$500 + 100 Extra Spins! Other Player Promotions at Magic Red Casino! Magic Red Casino offer their members several high value promotions that vary in type and form. These can be re-load bonuses of bonus cash and slot spins, casino races and much more. Make sure that you subscribe for receiving the promotional send outs from Magic Red Casino so you don’t miss out on some extra bonus promotions. Magic Red Casino’s VIP Program! Magic Red Casino do have a VIP Program available. The program is made up by seven different tiers; New Member, Bronze, Silver, Gold, Platinum, Premium and Prestige. New members will obviously start on the first tier but, depending on how much you play, you can quickly climb on the VIP ladder. The rewards and extra treats for the different VIP tiers are plenty including such specialties as extra fast cashout process, birthday bonuses, VIP tournaments, personal account manager, monthly cashback and much more. Magic Red Casino accepts all major payment methods such as Visa, Mastercard, Maestro, Sofort, Moneybookers Skrill, NetEller, Paysafe Card and several different regional direct banking solutions that vary from one country to another. All transactions and other stored information are protected by the most advanced encryption technology available. Popular Online Video Slots at Magic Red Casino! The collection of online video slots at Magic Red Casino is impressive and reach a number of close to 500 titles. The video slots are provided by some of the most established game developers including Play’n GO, NetEnt, Microgaming, NYX Gaming, ELK Studios, Thunderkick and many more. Some of the most popular video slots available at Magic Red Casino are Book of Dead, Starburst, Golden Grimoire, Gonzo’s Quest, Zodiac, Coins of Egypt, The Goonies and Sails of Gold.